Many sites try to convince you to set them as your homepage: for example, every time you visit google.com using Internet Explorer, the site prompts you to make Google your homepage (Firefox's default homepage is already a skinned google.com). Other sites are created just to become your homepage: from classic portals like Yahoo.com to personalized homepages like My Yahoo, iGoogle or Netvibes. But none of the sites is better than about:blank. Fortunately, most browsers have an option to set the blank page as a homepage, but you can always type about:blank to replace the default homepage. And next time when you install a toolbar or any other popular software, keep an eye on settings like "Make Yahoo.com your homepage". By default, most software from Google, Yahoo and Microsoft has the mission to change your homepage and the default search provider. What Firefox Theme is it on the Screenshot? Tangerine Firefox Theme with icons from the Tango Desktop Project. It has a lot of imperfections, but I still like it. "every time you visit google.com using Internet Explorer, the site prompts you to make Google your homepage"
I always use Internet Explorer, and when I visit google.com, it never prompts me to make Google my homepage. I've always seen this message in Internet Explorer 7. If you set Google as your homepage, it disappears. The message used to be even more annoying, but now it's just a link at the bottom of the page. First question i have after reading this entry was same as Pascal. IE7 still thas this long 'connecting to your home page' wait while it looks up about:blank against some antiphishing site or something. Or it just takes forever to start up the IE engine, and they blame it on the remote site. I find that for IE, Windows Update makes a good start page, as it is its sole remaining reason to be used. I'm a loyal about:blank user. But earlier today I installed Opera, and its default page was a speed dial, which I found counter-productive because I like interfaces to "shut up" every once in a while (and yes, I'm sure this speed dial can be easily disabled in the Opera options). I use an FF add-on with similar behaviour to Opera's Speed Dial - Fast Dial. It loads quite quickly (faster than Speed Dial, IIRC), is a tad more customisable, loads through about:blank (thank God) and I can use Alt+<number> for each of the sites. I don't even remember what I have set as my homepage. It's not important to me because I have my browsers set to reopen the last tabs I was using. That way I have continuity from one session to the next. Before I did this, I used to use whatever 'blank' option was offered by the browser, for speed purposes. I think that's a good idea if you're on dial-up, but few are these days. I prefer to use igoogle as my home page. However, my default page on start is about blank. I prefer the blank fresh start for fast loading times and minimal distraction. However, I love to hit that home button and have it send me to the launch pad for all of my net applications. I am editor of about:blank: http://www.aboutblank.nl. The one & only. Wow! There is a malware that replaces your homepage with about:blank. That's extremely cool. "This site is designed to help people who want to Remove about blank's annoying homepage hijack spyware and take back control of your PC today. 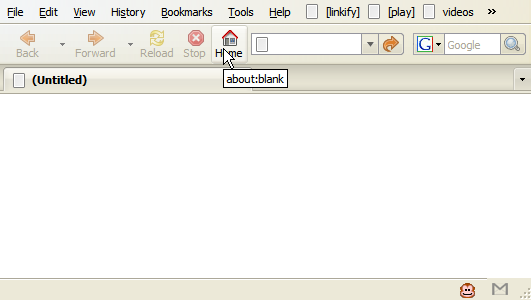 about blank is a Browser Helpler Object in geek language. In normal people language it means your browser has been hijacked. Your system is infected with hard to find remove spyware that can change your homepage to about blank page. 'about blank' infections may also slow your computer by consuming system resources." Of course, the site forgets to mention that this malware hijacks the about:blank page and people now associate the innocent about:blank page with malware. I don't Opera, but I have Firefox as my 2nd Browser. I'll visit that link and have a look. Thank you for sharing.